According to the research team, the discovery may be the first of its kind since the 1960s and 1970s, when biochemists identified troves of new fatty acids in various vegetable oils. Fatty acids represent the primary components of vegetable oils, which are best known for their role in the kitchen but have also found use in biodiesel fuels, lubricants and other industrial applications. The structures of the fatty acids housed within an oil help dictate both its health effects and industrial merits. Most off-the-shelf vegetable oils, such as canola or soybean oil, contain the same five fatty acids. Those conventional fatty acids all contain either 16 or 18 carbon atoms and feature similar molecular structures. By contrast, Nebraskanic and Wuhanic rank among a class of “unusual” fatty acids that contain fewer or more carbon atoms — both have 24 — and uncommon molecular branches that stem from those carbons. “We sort of had an idea of what the biochemical pathway might be, but it was completely different than what’s in the biochemistry textbooks,” Cahoon said. “These fatty acids also seem to be stored in the violet cress seeds in a way that we haven’t quite seen before for other vegetable oils. That unique assembly and structure could account for the corresponding oil’s superior performance as a lubricant, which was tested at the University of North Texas. Compared with castor oil, the violet cress oil reduced friction between steel surfaces by 20 percent at 77 degrees Fahrenheit and by about 300 percent at 212 degrees Fahrenheit. 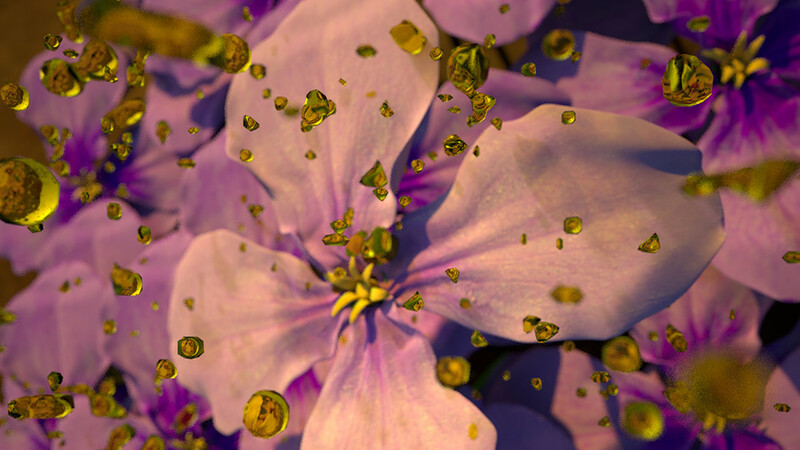 The “serendipitous” discovery of Nebraskanic and Wuhanic acid began in China, where Chunyu Zhang and his colleagues at Huazhong Agricultural University noticed a strange reading in a chemical analysis of the violet cress oil. Zhang’s team was using an analytical technique known as thin-layer chromatography. The technique involves depositing a sample of liquid onto a plate, then adding a solvent and forcing the resulting solution up the plate via capillary action – a physical force that allows liquids to move against gravity in confined spaces. Different components of the solution climb the plate at different speeds, creating distinct bands that offer insights into the original sample’s chemical makeup. To Zhang’s surprise, one of those bands seemed to have abandoned its typical perch higher up the plate for a spot farther down when the oil was deposited on a certain material. Zhang decided to consult his colleague Cahoon for a second opinion. After late nights spent confirming the anomaly and tracing its origins, the researchers tapped the expertise of Robert Minto and Alicen Teitgen at Indiana University-Purdue University Indianapolis, who spent a year helping to characterize the structures of the two fatty acids. The researchers authored the Nature Plants study with Juan Ling, Wei Zhang and Zaiyun Li of Huazhong Agricultural University; senior research associate Xiangjun Li and postdoctoral researcher Lucas Busta, both of Nebraska’s Center for Plant Science Innovation; Rebecca Cahoon, research manager in biochemistry at Nebraska; along with Asghar Shirani and Kent Chapman from the University of North Texas. The researchers received support from the U.S. National Science Foundation and the National Science Foundation of China. Reposted with permission, see Nebraska Today for the original article: https://news.unl.edu/newsrooms/today/article/international-team-makes-rare-discovery-of-new-fatty-acids/.